The Medium Tank M26E1 is a premium Rank IV American medium tank with a battle rating of 6.7 (AB/RB) and 6.3 (SB). It was introduced in Update 1.47 "Big Guns". Aside from the base model of a M26 Pershing, it boasts the long L/73 90 mm Gun T54, very similar to the T15E2 on the T32, allowing it to compete effectively against Rank IV vehicles with the mobility of the Pershing. The only distinctive characteristic of the M26E1 compared to the original M26 is the "T54" 90 mm cannon. The cannon has a longer barrel with a small muzzle-brake compared to its original design. The longer 90 mm cannon comes with the standard AP shot, HE shot, M82 shot (APCBC), and HVAP shot. All these rounds, except for the HE shot, have a higher pen and velocity compared to the standard 90 mm M3. The M82 shot is considered the most useful and efficient round for this tank as it has enough explosive filler (140 g of Exp. D) to "one-shot" many tanks in its battle rating while having little to no difficulty entering the enemy's vehicle. Belly armour is 25.4 mm thick. Counterweight on the turret rear is made of structural steel. Any tactic that works with the M26 Pershing can work with the M26E1. While its gun is quite potent, it also has quite a lengthy reload time after firing, minimum 11 seconds with an ace crew. As such, a M26E1 that fired is a great opportunity to pounce on provided no other enemies are around that remains a threat. The M26E1 has the same armour as the M26 Pershing, so any weapons that can cleave through one's armour can go through the other's. The best target is for a straight-on hit on the front glacis as the direct effective thickness is 146 mm of cast armour. Side armour is also quite thin, ranging from 50 to 76 mm and can thus be easily pierced by most weapons at the BR. Ammo racks of the T26E1-1 Pershing (layout identical to M26E1). The M26E1 was a post-World War II modification of the standard M26 Pershing. 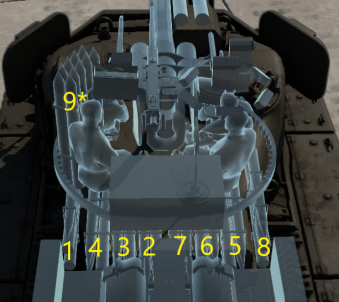 This modification changes the barrel length to 73 calibres long with the new 90 mm T54 gun. The gun offers some of the most powerful penetration in-game for Rank IV and is equipped with AP, HE, APCBC and HVAP Rounds. The M26E1 suffers from a very weak side and rear amour, though this is a common weakness on every tank. 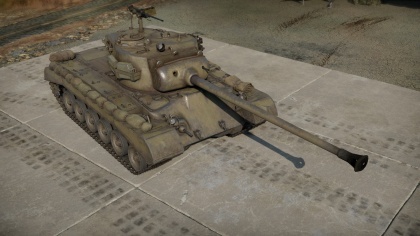 The front and front part of the turret is able to bounce some enemy shots, but can be penetrated by most other tank in its 6.7 Battle Rating range so beware. Playing the M26E1 is similar to the M26 Pershing. Armour and mobility of the two tanks are the same. The only advantage sticking out is the M26E1's more powerful gun due to the longer length. Though more powerful, the reload time is also longer than the normal M26 Pershing, so the play style should be more conservative to avoid being caught in an attack while reloading. Though equipped with a very powerful gun, the M26E1 suffers from the same M26 Pershing armour. Thus, it is very vulnerable to most tanks at its rank and so most of its combat life should be taking cover and avoiding large open spaces. The M26E1 presents the same mobility of the Pershing so this can be exploited in close quarters over the more cumbersome Panther, Tiger II, and IS-2's. Staying in cover and scooting out to take out enemy from their weak points on front or their vulnerable side armour should be the prime attack move for the M26E1 before retreating back into cover. Fighting against medium tanks will be relatively easy due to the gun's penetration value. Unless bounced, the gun could even penetrate the front glacis of the Panther tanks. The main problem the tank will face is the Tiger II and T32 heavy tanks and the later IS tanks such as the IS-3 and IS-4M due to their thick front armour. Flanking may be necessary for these heavy tanks, but some accurate shots to some known weak points on the front of these tanks can also work. 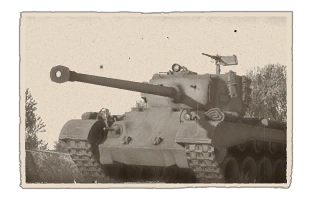 Tiger II (P) and (H): These are the more common German heavy tanks seen with the battle rating and are the most dangerous. The best tactic is to use the 90 mm gun to penetrate the turret cheeks and knock out the gunner. In the time period when the firing method is disabled, move in with the M26E1's mobility and hit it on the sides if possible. Jagdpanther: The 88 mm gun is a threat to the tank, but in close range the 90 mm APCBC round can penetrate the front armour, and the APCR can be used if wanting a definite result. IS-2: The IS-2 tank's 122 mm cannon can make short work of the M26E1, thus it is best to avoid being shot at in the first place. If in the situation where a fight with the IS-2 must be head on, fire a round through the turret cheeks and incapacitate the gunner for a more opportune moment to aim to destroy the tank. Shooting a lower glacis also works and if lucky may even knock out the tank. M82 shells have 210mm penetration compared to original M26's 160mm, making Tiger 2s much less of a threat. Acceptable frontal armour that might bounce 85mm and short 88mm shells if angled properly. Premium bonuses that adds to SL and RP. Very weak and vulnerable side and rear armour, meaning even the slightest over-angling will lead to a penetration from side. The M26E1 was a post-war variant of the M26 Pershing with the intent on increasing its firepower. During World War II, the 90 mm M3 mounted on the original M26 Pershing was equivalent to the German's 88 mm KwK 36 on the Tiger I. But looking for an upgrade, Ordnance developed the T15E1 90 mm gun, which was equivalent to the 88 mm KwK 43 on the Tiger II. This cannon was mounted on the then development model T26E1 to make the T26E1-1 tank. The T15E1 90 mm cannon was visibly much longer than the original 90 mm M3, with the length of 73 calibers compared to the 53 calibers of the M3 cannon. This allowed the cannon to have a much larger ammo charge and muzzle velocity. The first T26E1-1 model made was the only "Super Pershing" model sent to Europe. A second version was made from the T26E3 model, the production model of the T26E1, with a modified gun to use a two-piece ammunition rather than a one-piece version, plus a new gun mounting to remove the stabilizer springs required to hold the gun. 25 of these tanks were built and were designated the T26E4. After World War II, two military model M26 Pershings were converted to mount the T54 gun, which was essentially the same 90 mm cannon as the T15E1, but had a ammunition that was shorter, but fatter than the previous versions. The muzzle brake was shaved down from two to one baffle to compensate for the smaller chamber the cannon presented. This M26 Pershing with the T54 cannons were designated the M26E1 Medium Tank, but production was never reached due to budget constraints. Light tanks Light Tank M2A4 (1st Arm.Div.) · Light Tank M3A1 Stuart (USMC) · Light Armored Car M8 · M5A1 Stuart (5th Canadian Armored Division) · T18E2 "Boarhound"
This page was last edited on 16 March 2019, at 22:28.